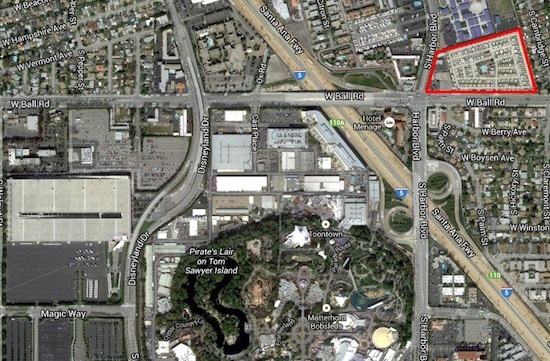 September 5, 2013, 9:26 AM · Disneyland has purchased an 11-acre site at the intersection of Harbor Blvd and Ball Road, with the intent to use the site for an employee parking lot. The site now houses the Anaheim RV Village, and Disneyland plans to put 1,400 employee parking spaces on the site, according to a Disneyland spokesperson. Resort expansion years ago claimed Disneyland's long-time, on-site parking lot for theme park employees. There's a parking garage on the north end of the property for Team Disney employees, but in-park workers have had to park as far away as Angels Stadium during busy periods in recent years. Disney provides shuttle buses from remote lots, but they have to navigate the same street traffic as everyone else. And that's while employees are off the clock. The land Disneyland has bought is outlined in red. For reference, the Mickey and Friends parking garage is the big building on the left. Map via Google Maps. Having a closer parking lot certainly will benefit Disneyland employees, but let's not overlook the longer-term potential for the site. If Disneyland could build a multi-level parking structure there instead of leaving it as a mere surface lot, that could create space on the site for additional offices and other back-of-house support facilities. Conceivably, that could one day open space now used for those purposes on the north side of Disneyland Park, allowing the park to expand into those areas. No matter how Disney uses its new land, having that additional space gives the resort additional flexibility in the years to come. September 5, 2013 at 9:43 AM · I appreciate this update. But one of the long time curiosities that I have had is how much land Disney owns/leases/controls. Do you have a suggestion for a web site that might have accurate info? September 5, 2013 at 9:44 AM · Here's a map with where the two most commonly used employee parking lots are located. The bottom red square is the lot most employees use -- the top red box is reserved for cast members who work in Critter Country and New Orleans Square. Regular cast members can park at TDA after 5:00 p.m. on weekdays, and any time on weekends (at least this is how it was when I was working there a year ago). September 5, 2013 at 1:58 PM · I really wish they'd buy out the motel and 7/11 at the corner of harbor and katella, behind carsland. That's the perfect spot for any show buildings for future rides that they might put in cars or bugs land or just for backstage space. But it's great to see Disney pushing forward it's resort expansion little by little. Little purchases like that are going to be necessary if theyre ever going to build a 3rd gate. September 5, 2013 at 2:11 PM · Too bad for the RV lot. These people will be displaced. I wonder why they are buying new property to house employee parking when they already have plenty of surface parking lots that are begging to be converted into multi-level parking structures. The Mickey and Friends parking structure has surface parking on the north and south. The Downtown Disney parking lots on the north and south. Of course, maybe they are holding out in case they expand Downtown Disney and/or decide to add a third resort on the space, but if this happens, they must add at least one multi-level parking structure in that general location. Any chance they'll build the structure there? Or perhaps the idea is to use this new space to offset the spots that will be lost during the construction of a multi-level structure at an existing lot? September 5, 2013 at 3:26 PM · I can't tell you how sad this makes me. I love that RV park! We stay there at least once a month and most of last summer. I wish Disney would consider keeping it an RV park! One can only hope that there will be an efficient, convenient structure that can both handle the additional traffic at the Harbor/Ball intersection. As a former Dland Cast Member, I recall the headaches of parking/bussing to the resort before the emergency clusterf***s of remote parking at Angel Stadium. September 6, 2013 at 11:55 PM · Disney absolutely plans to proceed with the construction of a third Anaheim theme park. This purchase was necessary so they can relocate the employee parking off Katella that is adjacent to the Toy Story Parking Lot. Disney will at some point build a guest parking structure on the site of Pumba surface lot. September 6, 2013 at 9:38 AM · Not only is Disney going to build a 3rd gate, they are REQUIRED to build it. When Anaheim gave Disney a TON of goodies back when they were building DCA, Disney promised Anaheim that they would build a 3rd gate and Anaheim is holding Disney to that. They only got a 5 year (I think) variance on the Toy Story lots. Those parking lots CANNOT stay parking lots beyond their variance. September 7, 2013 at 12:01 AM · Ted Heumann nothing you said is true. There were no concessions given on the condition that Disney build a third theme park. Absolutely, untrue! Planning and early construction of Disney California Adventure was already underway when Disney acquired the option to buy this property in 1998. All of the city (resort area) improvements were related to construction Downtown Disney, Grand Californian and California Adventure, not a third theme park. Shortly before the opening of California Adventure Disney jumped the gun (eagerly anticipating over demand for DCA) and posted a web site sharing the possibility of developing a third theme park on this property, but that proposal died quickly after the park opening. Disney then waited until 2009 before it approached the city with a plan to build a temporary parking lot on the property because they were losing the parking in the Lion King lots due to the Cars Land expansion. The plan was approved by the Anaheim Planning Commission granting Disney a conditional use permit for six years and if the public transit (Anaheim Fixed Guideway) wasn't built by then the permit would be extended for 4 more years for total of 10. It's true that the city has stated that they would like to see this property developed, but Disney is not required to do anything with this property. The company will develop it as the need arises, which I would argue is near. However, Disney would have no problem getting approval to extend the use of the surface parking if they so desired. When Disney ultimately decides what they'd like to develop then they may approach the city to discuss certain concessions, but only then will those talks take place. You don't create agreements like that when you're still uncertain about what you're planning to do and when you'll build anything, if anything at all. September 9, 2013 at 6:04 PM · Although it's true that a water park is going into Garden Grove, my understanding - from back when the OC Register allowed me to read it for free - is that it will be open to the hotel guests only, not the general public. September 9, 2013 at 10:15 PM · "I really wish they'd buy out the motel and 7/11 at the corner of harbor and katella, behind carsland. That's the perfect spot for any show buildings for future rides that they might put in cars or bugs land or just for backstage space." Locals might see it as some motel, but the Candy Cane Inn has been consistently rated by tourists as the best place to stay in Anaheim. In a city with a dearth of affordable, quality hotels, that matters. September 9, 2013 at 11:03 PM · I doubt they will ever do it, but sure would be nice if they built California version of Fort Wilderness. I was truly impressed by FW at DW and would like to combine RV camping with a Disney trip in CA.